The iPad is a great gaming device. So what would take that gaming capabilities to the next level? A controller of course! We have already seen a joystick-style case for the iPad called the iCade. It was arcade-style realistic and retro, but it was a steep $99 in retail, which turned off many to purchasing it. So Atari has decided to compete the iCade with their own joystick case, simply called, the Atari Arcade. Atari was the king of video game consoles in the late ’70s and early ’80s, with consoles like the 2600, which defined home gaming. But after a video game crash, Atari was overtaken by Nintendo’s NES, or Nintendo Entertainment System. Atari never really recovered from the crash, and eventually stop making current generation consoles. Today, Atari resells their old games through their Atari 2600 throwback console, and most recently, iOS games in the Apple App Store. To complete the throwback experience, the new Atari Arcade will feature an old fashioned, but not 2600-like, joystick on the left side, and four buttons in a square-shaped pattern on the right side. An iPad would rest in a dock-like space on the case that connects through the standard port on the iPad, and not through Bluetooth on the iCade. 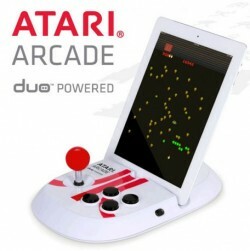 If a gamer enjoys playing the game “Atari Greatest Hits” on their iPad already, the new Atari Arcade is specially designed to work with the app. Because this case is not yet on sale, so far the only color it comes in is white, so if a gamer owns a white iPad, it would fit right in. The Atari Arcade’s price has not been announced yet, but it is likely to be cheaper because of its smaller size, and non-Bluetooth capabilities.